Spray an 8×8 pan with non-stick spray. Add semisweet chocolate to a double boiler, and melt completely. One melted, add in half of the sweetened condensed milk, the vanilla, the coffee powder and 1/2 tablespoon of coconut oil. Stir with a spatula until combined and fairly smooth, then spread evenly in the bottom of the pan. Mixture will be thick. Place in the freezer for 30 minutes. Add white chocolate to a double boiler and melt completely. Add in remaining condensed milk, coconut oil and coconut extract, stirring until combined. Remove fudge from freezer and add white chocolate on top, spreading evenly to coat. Top with toasted coconut, then chill in the refrigerator for 60-90 minutes. When ready to cut, fill a large cup with hot water. Dip a sharp knife into the water, then blot on a towel. 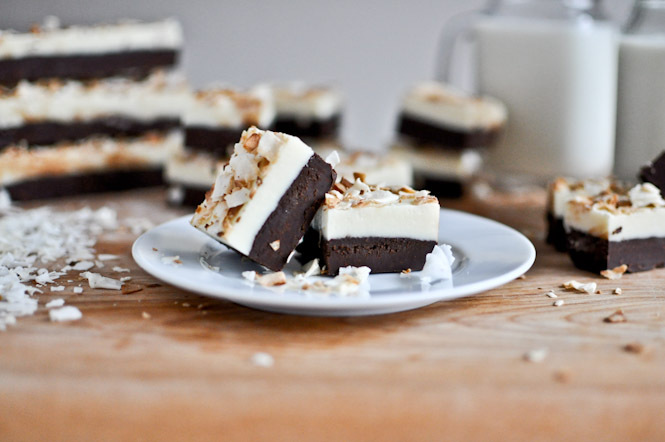 Use knife to cut fudge into your desired size of squares. Note: the melting can also be done in the microwave. I suggest melting the chocolate first on medium power in 30 second increments, stirring after each time. Once melted, add in remaining ingredients and stir until smooth. You can also use this Lindt Coconut White Chocolate for the coconut layer.